A while back on Day 148, I mentioned that I was going to a wedding and well, I went! Not that it’s particularly related to this post, but it was so not as much of a big deal (in regards to my weight) as I thought it would be… there were some good friends there, some people that I knew but never got a chance to talk to, and a few people that I might have purposefully avoided… what can I say? I’m still harboring a bit of a low-self-confidence-teenage-girl deep in my soul. But, it was entirely irrelevant whether I was wearing a size 16 or a size 8 (although, for the record, I was wearing none of those things… I was wearing a medium! ha!) and all that really mattered was getting to catch up with a good, good friend that I haven’t seen since graduation. And her life story was far more captivating than my dress size! Okay, but back to the topic at hand… which does have to do with the wedding though (more precisely, the reception), so stick with me. The wedding wasn’t until 3:00 and my husband, knowing that it would be just me wanting to talk to old high school friends, opted out of going, so he was going to stay home with the boys. Well, I was ready to go by 1:30 and I decided to duck out before the boys woke up so we wouldn’t have to go through the whole rigamarole of me leaving and their tears and waving to me and watching me drive away. And after I finished my one need-to-do errand, I realized that I had forgotten to eat lunch and… I still had an hour until the wedding. Afraid that they might not have something that I could eat at the wedding and being at the point where I was getting hunnnnnngary, I started heading toward Petra (this aweeeeeeeesome fresh Mexican food bistro in McKinney). 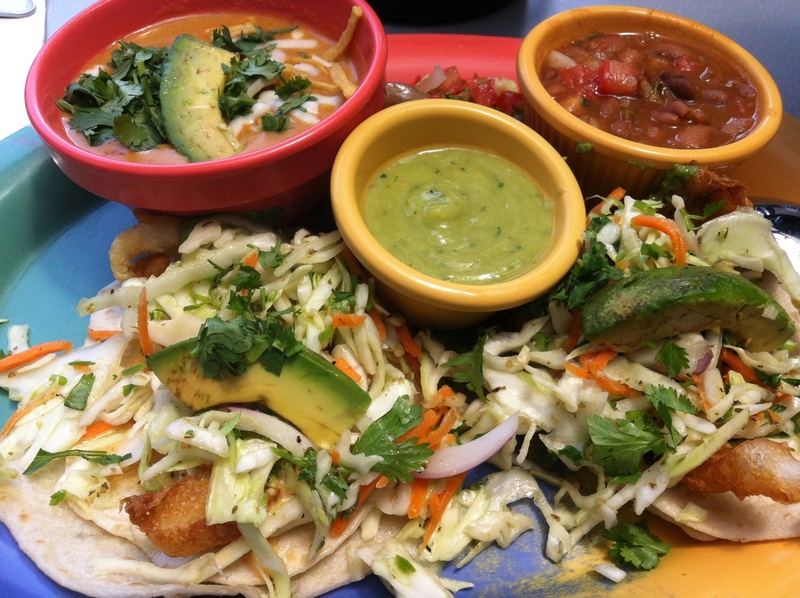 I got their fish tacos (yum.may.) with charro beans and tortilla soup… it was all uhmazing (there’s a pic of it at the top)! And I sat out on the patio all by myself (cause everyone else likes this stuff called air conditioning… weird, I know) and faced out toward the green belt behind the restaurant and listened to the music that mimics that I would hear on the beaches of Mexico. I ate just enough until I was full… okay, maybe a smidge past full but not feeling gross or anything, and then I went on to the wedding. The wedding was beau.ti.ful. and so special and I was just so… happy the whole time. It made me both relive the awesomeness of my own wedding and also made me want to renew my vows just so that I can have another wedding cause really, although they are a lot of work, they are also a lot of fun… and there’s the whole white dress thing. Loved her wedding dress. Well, at the reception, there was a whole lot more than just cake and punch… they had a brilliant spread! Sandwiches, fruit, cheese, crackers, etc. etc. etc. And my friends all got up from their table to go get some grub. I wasn’t hungry, but I also really wanted to hang out with them… so I went through the line with them… and didn’t get a thing. And I didn’t spontaneously combust because I didn’t get food. And no one pointed and laughed at me. And I sat back down with my friends while they snacked. d) how far God still can bring me! When I made my boys some Velveeta Mac N Cheese tonight, there was just enough leftover for a mini-serving. I, of course, still needing to fight some leftover instincts, thought about having it. Not as my dinner… just as a… as a… as an extra dinner, I guess. Then I took the boys’ servings to them. And that was it. It all seems so simple, doesn’t it. Just Say No. And in some ways it is simple. Really… saying “No” is the answer to so many problems in my life, but I avoid it so often. And often I avoid it when I need to say it the most! When I am already overwhelmed but someone at church asks me to do something, and I just can’t say “No” even though saying “Yes” is going to be detrimental to me. When I see my Facebook icon on my phone even though it is time for me to read my Bible… I should say “No” but so often I choose to say “Yes” and scan through my News Feed. When I’m tempted with too much food, then I so often should say “No” but I find myself saying “Yes” and taking another bite, and another, and another. I mean, I’m sure that there is a reason that the “Just Say No” phrase was the catch phrase for the anti-drug campaign in the 80s. But there is also another part to that No… and it’s another “Just” statement: Just Do It. Oh, my dear Nike. If only it were that easy then I would have a rocket hot bod that could run a marathon. As it is, I am lucky to be able to run across the backyard after my toddler. So much of my struggle over the years has been saying no in my head but then not following through with my body. I would be standing in the pantry eating another Thin Mint (and really… that name is SO DECEPTIVE cause they do NOT make a person thin! Haha!) after having already eaten ten or eleven, thinking “NO! NOT ANOTHER ONE! NO MORE! STOP!” But it was like my hand would just keep reaching into that bag. And I like especially the last verse because it tells us HOW to Just Do It. And the best part is that it is sooooo much easier than Nike’s expectations! We are to let the Spirit renew our thoughts and attitudes. That means that God is the one doing the work! The thing though that we are responsible for is the “let”. You might be thinking, “Huh? We have to do the ‘let’ part of it? What does that even mean?? ?” We have to LET the Spirit renew our thoughts and attitudes. And how does the Spirit do that? Mainly, through the Word of God. Which means, that for the Spirit to renew us, we have to be reading The Word of God. I feel like I’m a broken record on this, but again, this blog is for me! Hehe, and I need to hear those words over and over again. I’m just not going to experience a God Life if I don’t read the Bible. Plain and simple. And I want a God Life. And I want it more than I want food. And I want it even more than I want chocolate. And… well, that’s a lot!